Vernon F. Leidig served as Professor Emeritus of Music at California State University Los Angeles where he was presented the Outstanding Professor Award for teaching, scholarship, research and professional advancement. His experiences included teaching instrumental music in the secondary schools in Los Angeles, where his teaching principles earned him a Certificate of Merit from the United States Department of State. He was well-known throughout the United States as a clinician, adjudicator and conductor. 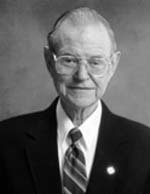 Dr. Leidig published many music education materials during his lifetime, including college texts and magazine articles, as well as numerous arrangements for school and community orchestras and bands. As one of Richard Meyer's most important mentor teachers, his legacy still lives on.